I thought quinoa was going to be the grain that finally defeated me. I have tried to cook with it several times and never managed to get rid of the soapy taste. When I saw this recipe in "At home in the wholefood kitchen- celebrating the art of eating well" I thought I'd give it another chance and I'm so glad that I did as this recipe for Quinoa with Summer Roasted Vegetables and Harissa Marinade was packed with flavours and none of them were soap! With her love of whole food and expertise as a chef, Amy Chaplin has written a book to entice everyone to eat well every meal, every day. She provides all the know how for creating delicious, healthy dishes based on unprocessed, unrefined food - from the basics of good eating to preparing seasonal feasts all year round. 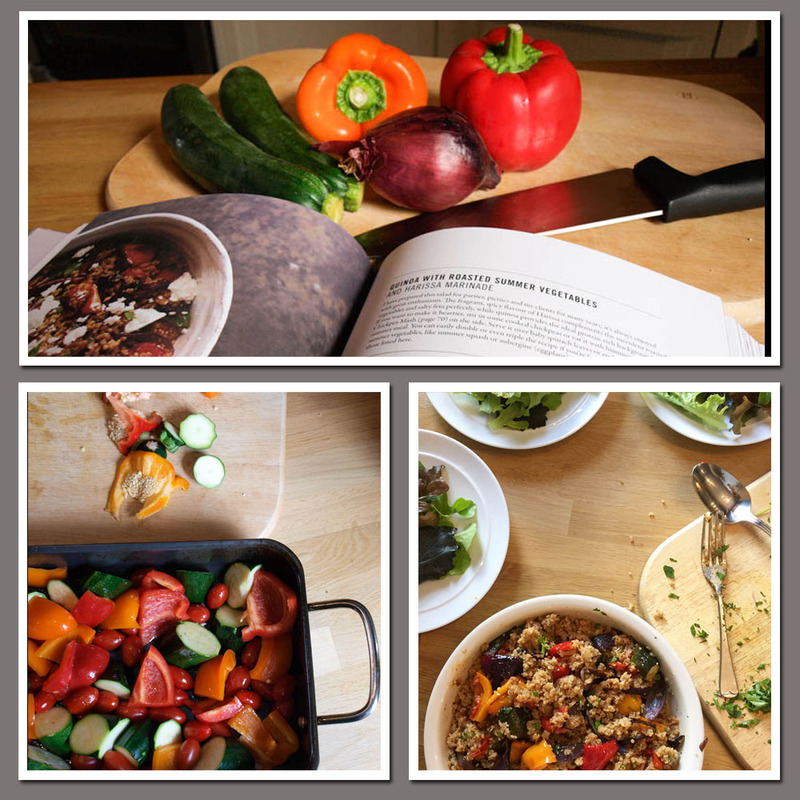 About the Author: Amy Chaplin has worked as a vegetarian chef for over twenty years. She is the former executive chef of New York’s renowned vegan restaurant Angelica Kitchen, a recipe developer, a teacher, and a private chef whose clients include Natalie Portman and Liv Tyler. Amy’s delicious vegan and vegetarian cuisine has appeared in numerous publications, including Martha Stewart Living, Vogue, the Wall Street Journal, New York magazine, the Guardian, the Vegetarian Times, Oprah magazine and the Washington Post. A native of Australia, over the last two decades Chaplin has worked as a chef in Amsterdam, London, Sydney, and New York. She currently resides in New York City. Find more of her original recipes at amychaplin.com. This is a large book and something of a wholefood primer. My own introduction to wholefoods came about in the late 1970s and it was Gail Duff who influenced my interest in whole and healthy foods. Amy Chaplin had the benefit of growing up on a community farm by parents who cooked and ate the food that they grew there. After Amy's introduction and biography, you move on to The Pantry, which for Amy includes vegetables and fruits that sit out on the kitchen worktop. Amy introduces us to whole grains, beans and pulses, nuts and seeds, superfoods such as goji berries and help seeds; oils, vinegars, seasoning and condiments. But it doesn't stop there, we learn about seaweeds, spices, pantry vegetables and a feast of ingredients for the fridge and freezer. Natural sweeteners, bottled and canned items and I doubt if the pantry door will close! Amy then gives us a run down on equipment we should aim to have in our kitchen, although she does recommend slowly collecting good-quality pans to last a lifetime. Two luxury items are included which Amy uses daily, a pressure cooker and a Vitamix blender. Cooking from the Pantry, this section is divided into Grains, Beans, Nuts and Seeds and Roasting Vegetables. Before you start cooking any of the recipes, each chapter has detailed instructions on how to prepare and the ingredients. Here are a few of the recipes I liked: Simple Quinoa (this was the basic recipe I followed for the featured recipe), Lemony Marinated Lentils sounds delicious, Tamari Toasted Seeds are bound to be a hit for snacking or sprinkling on salads. The Roasted Vegetables are prepared with coconut oil and fresh herbs. Pantry Recipes takes these basics a little further with a range of creative dishes such as Steamed Greens with zesty flaxseed dressing, Wholewheat fettucine with kale, caramelised onions and marinated goat's cheese, Dijon mustard marinated tempeh and garlic tamari-braised tofu. 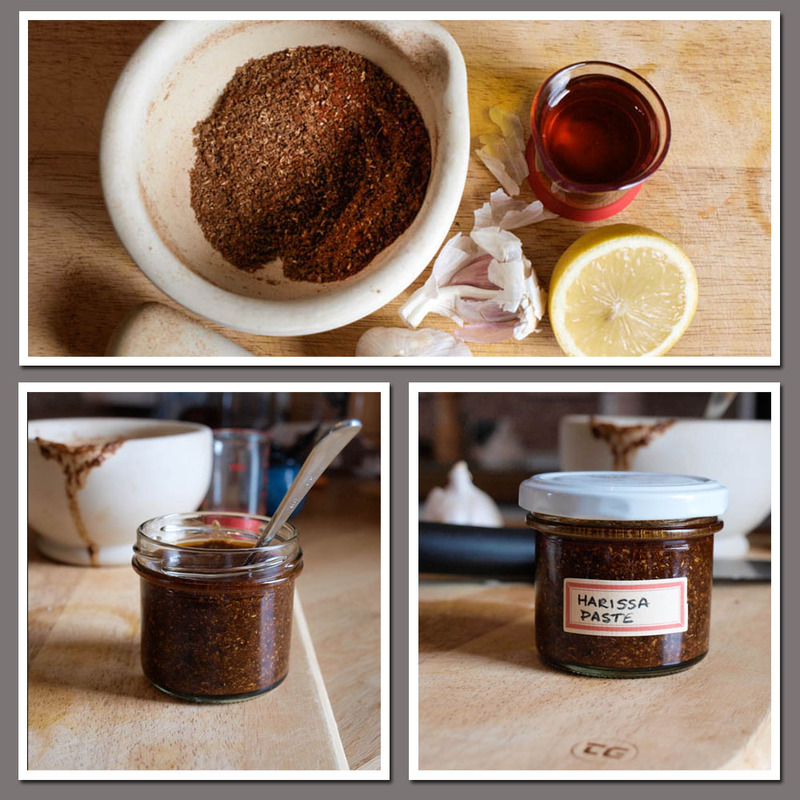 There are some really great Make-Ahead Condiments including the harissa, I made for my recipe, tahini sauce and toasted almond butter. We are just about half way through 'At home in the whole food kitchen' and we are just starting with breakfast. I wouldn't refuse spelt almond waffles, blackberry cornmeal muffins or pumpkin bread with toasted walnut cinnamon swirl or coconut and quinoa pancakes. Soup is easy to make and easy to keep healthy and whole food, I really must make pea and courgette (zuchinni) soup with dill. Miso soup was one of our 70's stand bys, Amy makes a hearty winter miso soup with adzuki beans, squash and ginger and I love the sound of the luscious spicy carrot soup with Kaffir lime leaves and coconut. Salads doesn't herbed spelt berry salad with peas and feta sound good? As does shaved fennel beetroot salad with blood orange and crushed hazelnuts and, of course, the quinoa with roasted summer vegtables and harissa marinade (recipe below). Everyone loves snacks, nibbles and drinks and this chapter doesn't disappoint, rustic pea spread, roasted red pepper macadamia pate, black sesame rice crackers and to wash it down rhubarb rose infusion or turmeric lemonade. We are by no means finished yet, Whole Meals serves up dill roasted plum tomato tart with pine nut crust, tempeh portobello burgers, butternut squash lasagne with wholewheat noodles and sage tofu ricotta and heirloom bean bourguignon with celeriac mash. Desserts can be whole food too, there is a range of tarts including fresh peach with walnut crust, coconut custard tart with toasted coconut crust, date pistachio praline tart and dark chocolate truffle tart with Brazil nut crust. Other sweet treats include apricot coconut bars, pistachio sultana cookies with cardamom and earl grey fruit cake. At home in the whole food kitchen finishes with a little essay on tea, in all it's forms, Amy's thoughts on cleansing and healing with whole foods, some guidelines and menu suggestions and finally why we should eat organic foods. This book would suit both the novice whole foodie and experienced vegetarian and vegan cooks. The extensive information about ingredients, and how to prepare them, is well written and, so far, the recipes have worked for me. The recipes themselves are interesting and varied, with some rather different combinations of ingredients to satisfy the most adventurous cook. Well written recipes including instructions on how to prepare various pantry ingredients. Lots of well styled clear photographs. It is a big heavy tome of a book, certainly not for reading in bed! When I first looked at the recipes I was a bit put off by some of the ingredients, but on closer inspection most are easily available and there are only a few that I would struggle to source. If you want to eat more healthily or simply explore some different recipes, then this is a great place to start. You will learn the how and why of whole foods as well as having recipes to follow, allowing you to create your own healthy vegetarian and vegan recipes. 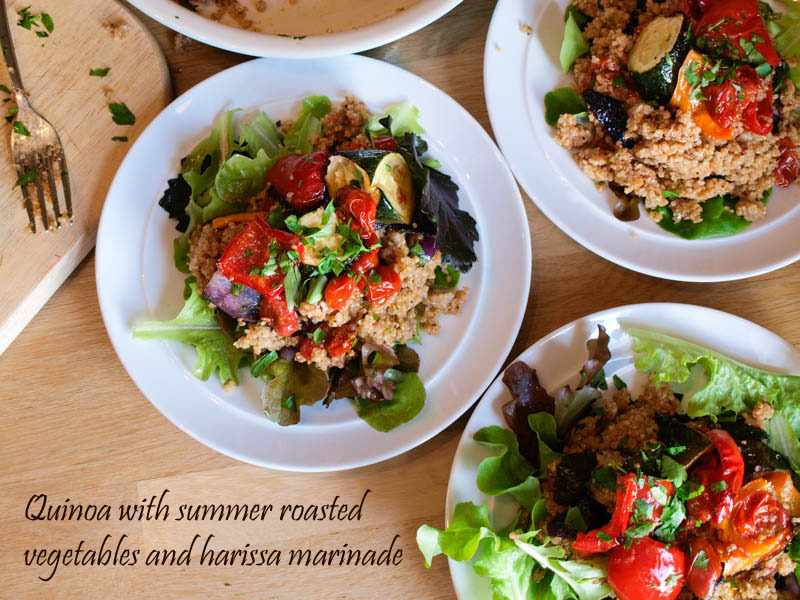 I was so impressed by the recipe, not only was the quinoa perfectly cooked, the harissa was the best I've ever tasted with the combination of the ingredients making a fabulous meal. Pre-heat oven to 200C/400F/Gas mark. Line 2 baking trays with baking parchment. Place courgette (zucchini), peppers (capsicum) and cherry tomatoes in a bowl and toss with 3 tbsp of the olive oil and 1/2 tsp salt. Divide vegetables between baking trays and spread out in a single layer. Roast for 25 minutes. Gently stir vegetables, rotate trays and roast 10 minutes more or until browning, Remove from oven and set aside to cool. Warm remaining 2 tbsp olive oil in a frying pan over medium heat. Add red onion and saute for 5 minutes. Lower heat a little and cook for 15 minutes longer, stirring every minute or so, until soft and caramelised. Stir in a pinch of salt remove from heat and set aside to cool. Transfer quinoa to a large bowl, fluff with a fork, add harissa and mix well. Add roasted vegetables, caramelised onions and parsley; toss gently to combine and season to taste with additional salt. Crumble feta over top and serve garnished with olives. Warm a small to medium frying pan over medium heat. Add cumin, coriander and caraway seeds, toast seeds, stirring continuously, for 2 minutes or until fragrant. Transfer to an electric spice grinder and grind until fine. Place ground spices in a bowl then add paprika, cayenne, garlic, salt, olive oil and lemon juice. Stir until smooth. Store in a sealed glass jar in the fridge for up to two months, or as mentioned above leave out the lemon for storing indefinitely. Wash and soak the quinoa in at least 720ml (24fl oz /3 cups) water for 8 to 24 hours. Drain and rinse the quinoa. Place in a 2 litre (3 1/2 pint) pan and add filtered water and salt. Bring to the boil over high heat, cover pan, reduce heat to low and cook for 15 minutes or until all the water is absorbed. Remove from heat and set aside, covered, for 5 - 10 minutes before fluffing with a fork and serving. Once cool, quinoa can be stored n the fridge for up to four days. 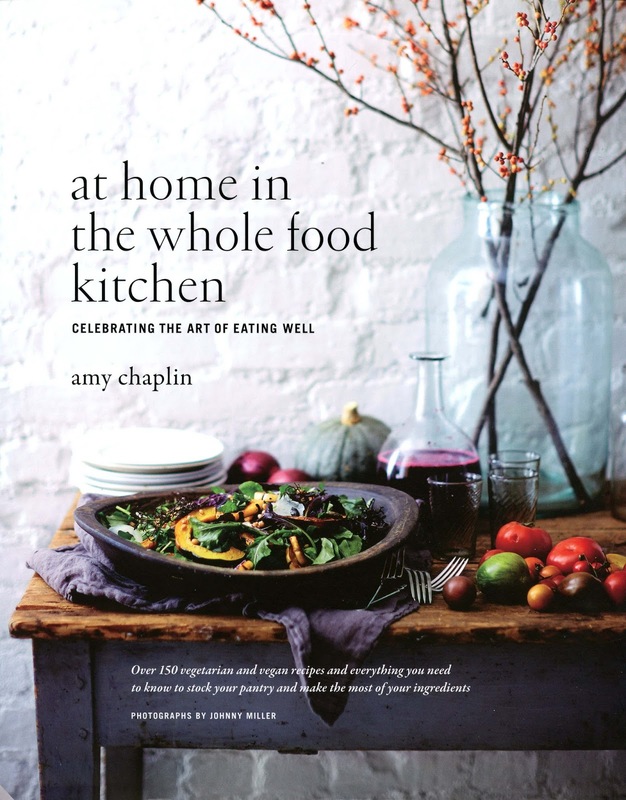 I have a copy of At Home in the Whole Food Kitchen: Celebrating the Art of Eating Well to GIVEAWAY, simply follow the instructions on the Rafflecopter widget. I have being really enjoying the trend for vegan cookbooks recently, I always get plenty of new ideas from them. This looks like a great book and I love Harissa too! Thanks for a wonderful review. My favourite whole food is Bulghar Wheat, love it! Nut & fruit mix. love that. My favourite ingredient is a simple red pepper, it can be used in so many things and is so versatile, delicious and good for you! It's a fabulous book, isn't it? Your salad looks amazing and the harissa sounds good, although I've never seen it made without chilli peppers before. I love Lentils. I add them into lots of meals. I love them in Shepherds pies. I love chickpeas - so versatile - falafel, houmous and the new vegan magic ingredient aquafaba. Quinoa for me - using it in so many things that I cook now! I love lentils, you can do so much with them! Quinoa. Now that I know how to prepare it properly, I love it. The book looks great, must check it out. That quinoa salad sounds delicious! Thanks Deon, I do love to review cookbooks. Ooooh another cookbook to go on my list. I know i've said it before but I LOVE your book reviews, so brilliantly practical and always with a stunning recipe and pictures. I adore quinoa but like you had not really had much chance to cook with it. This looks like an excellent and very tasty salad. I love Quinoa but struggle to cook it without it turning to mush! I hereby confess to buying it ready cooked in packets. Chickpeas, I love them - very versatile as a flour, for pakoras and in curries. I think my favourite is barley - it's great in soups and stews but also makes a great alternative to rice and is fab with a spicy tagine. It has cayenne pepper in it, which is a form of chilli, nice and subtle heat. Thanks Lucy, it was really good. Thanks Dom, hope you enjoy cooking more quinoa soon. Ha ha! I don't like to be beaten by a foodstuff, good luck reading this book in bed, hope you don't nod off and give yourself concussion! Red lentils, they are so versatile! I like the idea of the quinoa salad. I really like wheatberries, great in salads! Black Beans versatile and healthy! lentils help me keep cooking simple and cheap. Short grain brown rice is my favourite! I discovered Freekeh the other day. I like that!